Client for this project is a non-profit organization running a play-space in a closed school building. 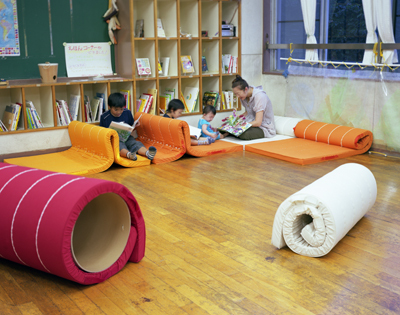 Their request was to design furniture for parents and children to read picture books in relaxed atmosphere. I came up with an idea of “sport-mattress”, which we used in a physical education class at school. I transformed it into furniture by rolling and bending, to be used in multiple ways. Kids will discover different shapes and curves, and use it as pillow, chair, tunnel or any other way they think of. Sometimes it becomes a personal room for meditation. And they use it as a sofa for chitchat, or lie down on it like a rug and read with friends. It even becomes a nice vehicle for a long ride. Kids enjoy playing with it freely, as if they are playing with their pet. It is a unique piece of furniture that people find various ways of use, while enjoy playing with it.